If you are a bit of a movie geek like me then this is something that might well make it onto your lists! Backyard cinema was founded by a group of friends who started off showing movies in their back garden. It has now grown into something far bigger and even more amazing. 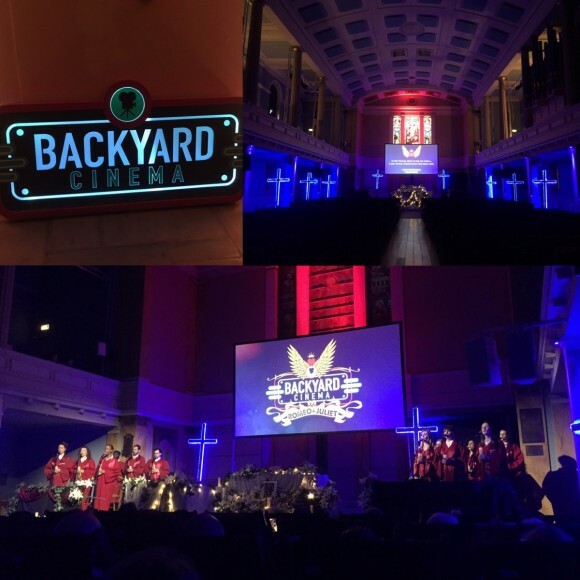 Backyard cinema is now a roaming theatrical cinema that shows a wide selection of films in a variety of iconic, unusual and immersive locations both indoors and outdoors around London. Often creating a physical world surrounding the movie using in depth set buildings, actors and live music, each show is turned into a unique experience. This was my first time at Backyard cinema and I wasn’t disappointed. Sat in deck chairs, my girlfriend and I watched Baz Luhrmann’s Romeo and Juliet in an old church which was decked out in the same style as the church in the actual film. There was a full choir who took over when the musical parts came on screen singing classics like Young Hearts and Everybody’s Free which was incredible. They also have a bar and snack carts to help keep away those mid movie munchies. I’m a movie geek at the best of times but this was an amazing movie experience in a mind blowing setting. If you’re ever in need of a couple of hours of feel good escapism then this is definitely one for your lists.